With the on-going UNWTO general assembly, it appears all roads lead to Livingstone, fortunately, the main highway from the capital and other parts of the country passes through Choma where any dedicated Zambian art collector or devotee should be making a stopover. 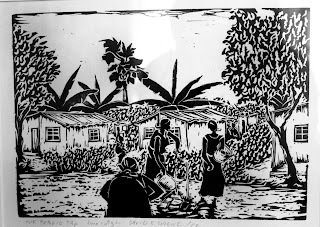 The Choma Museum and Craft Centre (CMCC) is currently showing works by some of the country’s most important printmakers in an exhibition entitled Graphic Art of Zambia that celebrates an almost forgotten art form in Zambia. The show is also a historic anthology of the genre and its artists from the 1960s until today. It features Cynthia Zukas MBE, the Lusaka Artists Group – as of 1977 Zambia Association of Artists – collective of Bert Witkamp, Fackson Kulya, Patrick Mweemba, and David Chibwe alongside Lutanda Mwamba, William Miko, Agnes Buya Yombwe, Jonathan Leya, Patrick Mumba and Adam Mwansa. Also featured in the show are the two indigenous forerunners of post-independence contemporary Zambian art, the scholarly Henry Tayali and the fabled free spirit Aquila Simpasa. 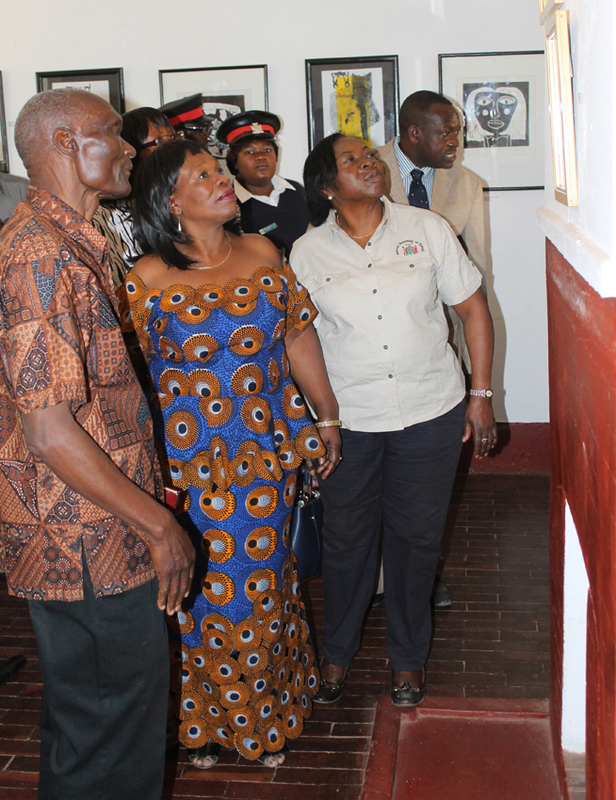 Opening the exhibition as guest of honour on Wednesday morning, Minister of Chiefs and Traditional Affairs Professor Nkandu Luo, who was accompanied by her two deputies Susan Kawandami and Robert Taundi, described the exhibiting artists as unsung heroes for their contribution to the public good. And in his opening remarks after conducting a tour for the officials CMCC Executive Director Mwimanji Chellah said the Choma museum board and management conceived the exhibition as a side event for the UNWTO. Meanwhile, National Museum Board Executive Secretary, Flexon Mizinga explained that the exhibition intended to “Bring out the Zambian character, the uniqueness of ‘us’ and these artworks portray that in a very special way, we are Zambians because of what we do, we eat, how we treat each other and so these artworks portray that but in a very special way,” he added “It is our hope that some of our guests will find their way here. As of yesterday we were yet to confirm that some of them have signed up so that the UNWTO can spill over into here, buses can be provided”. Chellah later introduced the museums co-founder and art exhibition co-ordinator Bert Witkamp an artist of Dutch origin who has lived in the country for over 30 years. “In this room, there are a lot of people who can talk about art in Zambia starting with that man (Chellah) that I have known for 40 years since the first time I came to Zambia. There is also Simon Chungu (artist), Patrick Mweemba (artist) and there is this gentleman who helps put arts in Zambia on the map nationally and internationally Andrew Mulenga (the author) we are very happy to have him here,” said the self-effacing Witkamp as he almost shied away from taking the floor. He explained that although the exhibition was about printmaking, it was also about drawing in pencil, in charcoal and in pen. “Let me say something about printmaking. 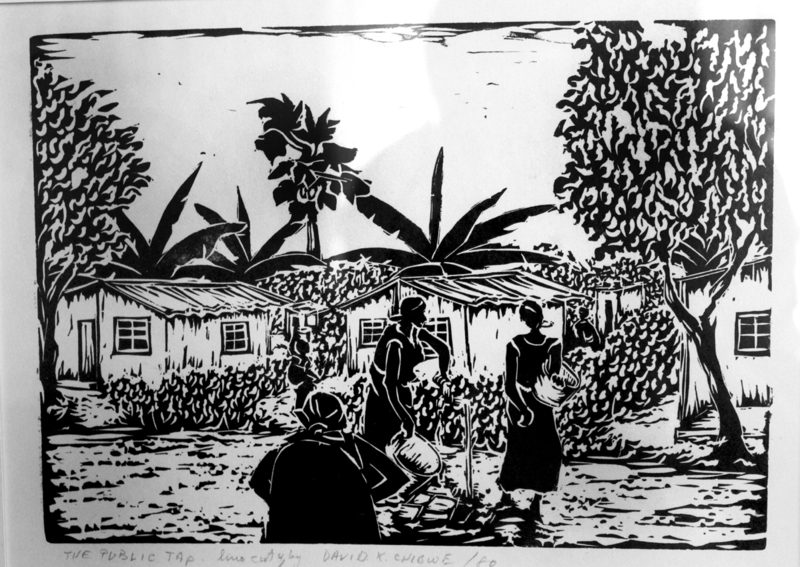 Before we hardly had any – contemporary art – print makers, the first one was Cynthia Zukas who was the pioneer and has made a great contribution in the arts in Zambia; the second one is Henry Tayali one of Zambia’s greats who died in 1987 the third one involves I. When I came here in 1975, I looked for – grassroots – artists to work with. The Tayalis and a few others were on one side of the social ladder because they were educated and had important positions in social life”. He disclosed that he worked with artists from the shanty towns, Mtendere to be specific with little or no education and in those days the Zambian art scene was very small. And before she officially opened the exhibition, Professor Luo, who was honestly fascinated by the way CMCC has been working with the rural women of the community in far flung places such as Kanchomba in Pemba East after its board Vice Chairperson Ellie Choonde revealed that traditional Tonga baskets sold through the museum are a source of income for the rural women and have found their way into the interior décor of many hotels countrywide. “What is exciting about this museum, it is different from other museums I have visited in Zambia in that they are speaking to the international discourse which now says we should move away from thinking that museums or heritage sites will be protected by the learned but that we should involve communities in the protection of our national heritage”, she said. And in her closing remarks, on a lighter note, the minister said she knew the works of Henry Tayali because incidentally her older sister was married to an artist and an actor in the name of Edwin Manda and because of him, her family got to know many creative people, visual artists inclusive. “I got to know the works of Henry Tayali and others but today I will be happy to look at work by people we call unsung heroes, our visit today is not really looking at the art but actually celebrating the unsung heroes through the art they have created”. Still, as far as art appreciation goes, we still have a journey to go. As much as the minister was familiar with Tayali’s work, it was evident a few members of her entourage were not. Some could be heard softly murmuring in disbelief at the average K2, 000 (two thousand kwacha) price tags, thinking these were too high. 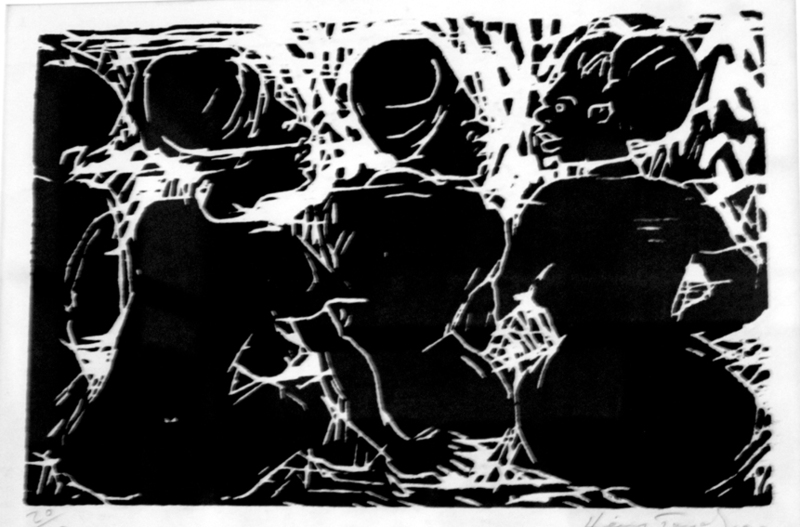 In actual fact, a good Tayali print can fetch way over US$2,000 (two thousand dollars), so to have a total of seven of these works on sale in Choma right now – the oldest being a 1979 print entitled Woman’s Talk – is a surprise in itself. 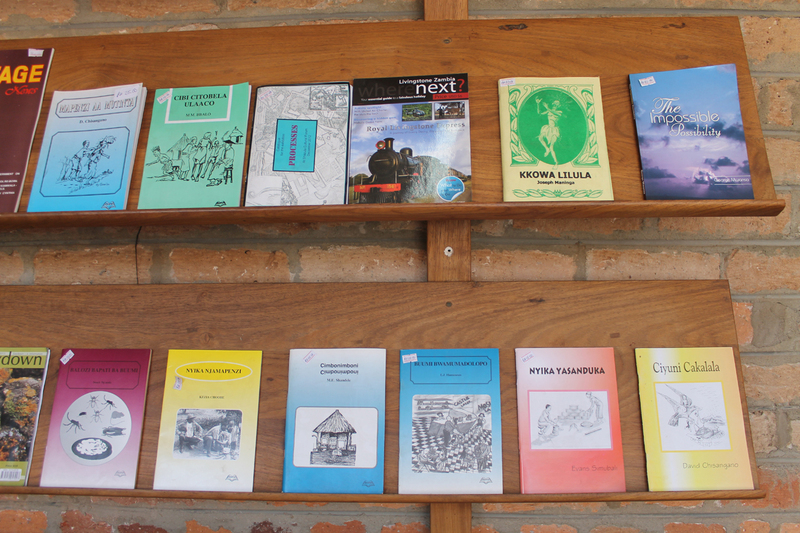 These treasures are at risk of being whisked away by foreign museums never to be seen by less privileged Zambians again. Work by African artists is currently a hot commodity; there is a recharged worldwide recognition of the vibrancy of contemporary art made on the continent. Or in the words of Financial Times “African contemporary art is hot,” as it announced, after the London auction house Bonhams achieved a record US$850,000 for a work by Ghana’s El Anatsui, an artist who still lives and works on the continent last year. Bonhams, which has been consistently holding exhibitions dedicated to contemporary African art for the past five years actually has an African Art department, and its director Giles Peppiatt is reported to have told Naveena Kottoor of the BBC World Service that compared to contemporary art from other parts of the world, the prices for African art are still quite modest, and investors are seeing it increasingly as a good investment. “Public museums don't have lots of money, so their curators have to look over the hill and see what might be the next big thing," Peppiatt told the BBC. There have also been reports that, even in times of global economic uncertainty, institutions such as the Tate Modern – one of the leading contemporary art museums in the world – is stocking up on its African collection. So it would be no surprise if the Tayali prints are quickly whipped up. 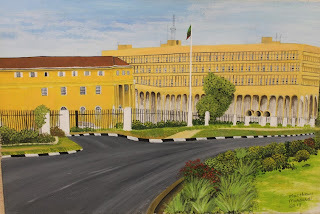 Nevertheless, returning home, for anyone who has been studying the Zambian art scene with regards political will, it can be interpreted as both a welcome and encouraging act when a high level entourage of government officials, in fact the entire top brass avails itself for the opening of an art exhibition. Particularly when it is from a ministry that does not oversee the arts. 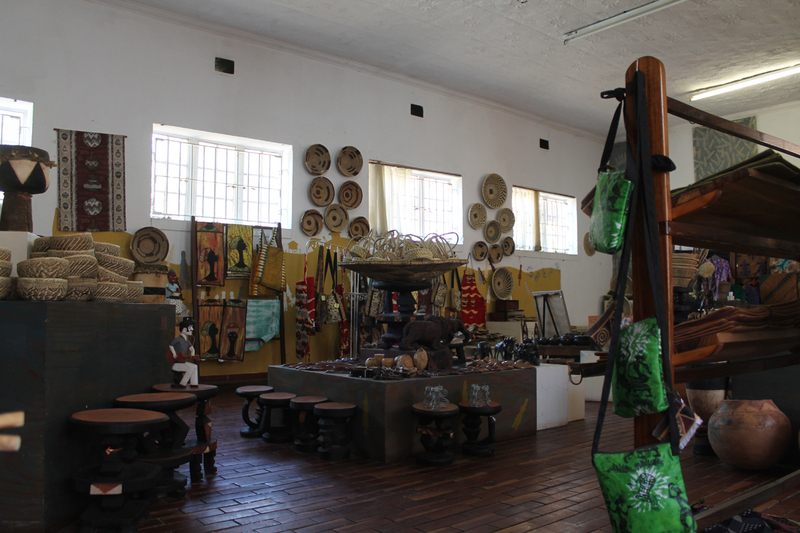 The chief’s ministry oversees museums under deputy minister Kawandami who oversees development in the ministry. Anyway, maybe, just maybe the arts are slowly, but finally getting recognition. 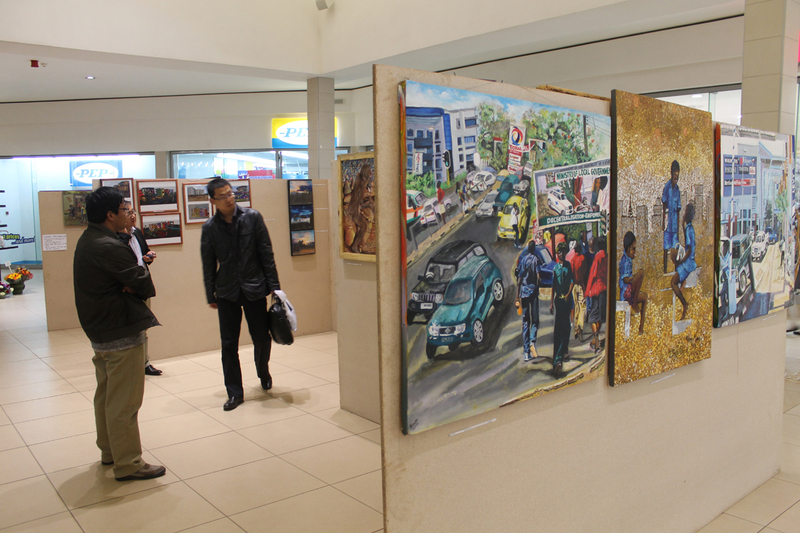 The Graphic Art of Zambia exhibition runs until October. Livingstone is well known for its most popular natural wonder, the Victoria Falls, but last Saturday the town’s main street came to a standstill as a manmade-wonder, the massive wire and steel rod sculpture of an Elephant was hauled through during the commemoration of the World Lion’s Day that was subsequently trailed by the World Elephant Day on Monday. 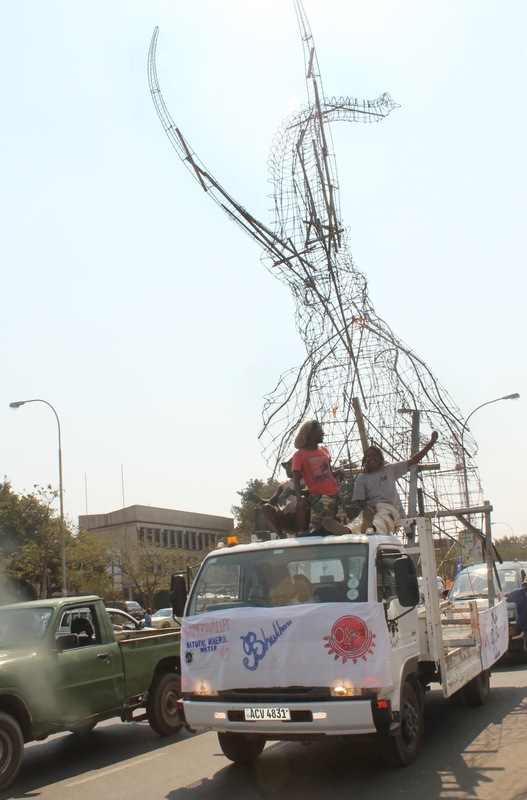 Nick named Green Elly; the jumbo was without doubt the star of the World Lion’s Day parade which according to the event organiser Sandy Simpson of Green Rural African Development (GRAD) won the inaugural World Lion’s Day award that is granted to the best of such events in the world. Although Green Elly was in the procession, her allegiance stretches far beyond commemorating wildlife days. Green Elly is here first and foremost to eat, because she is hungry, very hungry but unlike other elephants she does not eat leaves, fruit and grass, she feeds on plastic, anything plastic but particularly plastic bags and bottles. She was built by artists of the Kachere Art Studios, as part of their Funta-Funta Art Project – loosely translated as "crazy art” ­­– at their Think Green Laboratory in Livingstone and she is a prop for their worldwide environmental education activities and exhibitions who’s main objective is to create a green generation by encouraging conservation, tree planting, environmental awareness and recycling. Green Elly is currently positioned on the Civic Centre lawns near the Livingstone Museum, on a space generously provided by the Livingstone City Council where like her distant cousins the Rhino near Long Acres Roundabout in Lusaka and the Nyami Nyami in Siavonga also built by Kachere, she will be stuffed with plastic waste generated before, during and after the forthcoming UNWTO general assembly, an exercise Kachere hopes will help to educate the community on the dangers plastic poses to the environment, besides promoting tourism once completed. Kachere as an arts outfit is ran in the pseudo-traditional village concept and has a Mfumu (chief) and Ndunas (village elders or wise men) and according to the Mfumu, Alexis Phiri, the team has been collecting litter from the airport, hotels, restaurants, townships, Victoria Falls and the city dumpsite known as Marabo – a colloquial play on the word “rubbish”. The Mfumu also claims that the team has litter collected from former US presidents Bill Clinton and George Bush Jr’s recent entourages to Zambia waiting to go into the belly of Green Elly. There is also “donations” of litter from Grant Cumings, whose family runs two properties, Chiawa and Old Mondoro, in Zambia's Lower Zambezi National Park. Cumings will provide a truck load of plastics donated by the various camps in the region. And on Thursday, Green Enviro-watch donated litter from their on-going workshop that goes under the theme “promoting environmental tourism”. 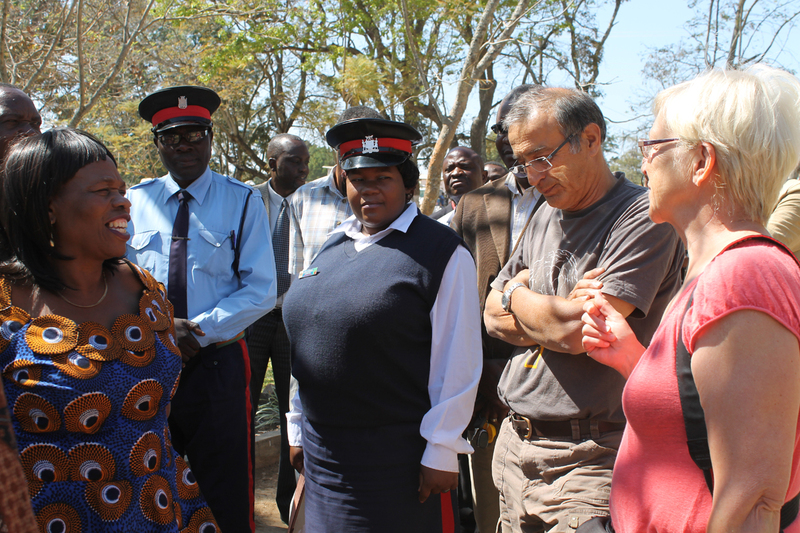 Kachere is currently in talks with the National Heritage Conservation Commission’s South West Region management for permission to place bins made from soft steel and wire at the entrance to the falls. It appears with every new project, Kachere’s passion towards conservation increases and the hope to do something bigger. 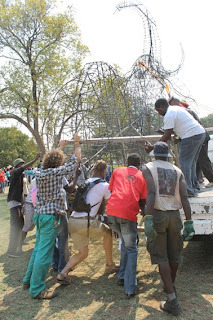 Besides the Rhino and the Nyami Nyami – which is still a work in progress – the team was part of the COP17 African Caravan of Hope in 2011 along with other ecological activists and were very militant during the Durban Conference trying to breakdown the conference jargon into simpler terms that the average person on the street can understand. 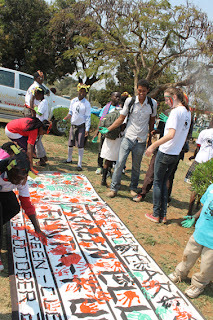 What's more, the last seven years have been a journey of educating everyday Zambians on climate change so much that one can safely say they are the country’s most aggressive art collective when it comes to environmental awareness with their Funta-Funta brand of art. Last year alone, they conducted a three day environmental entrepreneurship and arts training workshop in collaboration with the German Development Cooperation (GIZ) for women and children at the Naluyanda Integrated Development Organization (NIDO) as well as environmental awareness lessons with children from the infamously menacing Chibolya shanty compound in Lusaka. 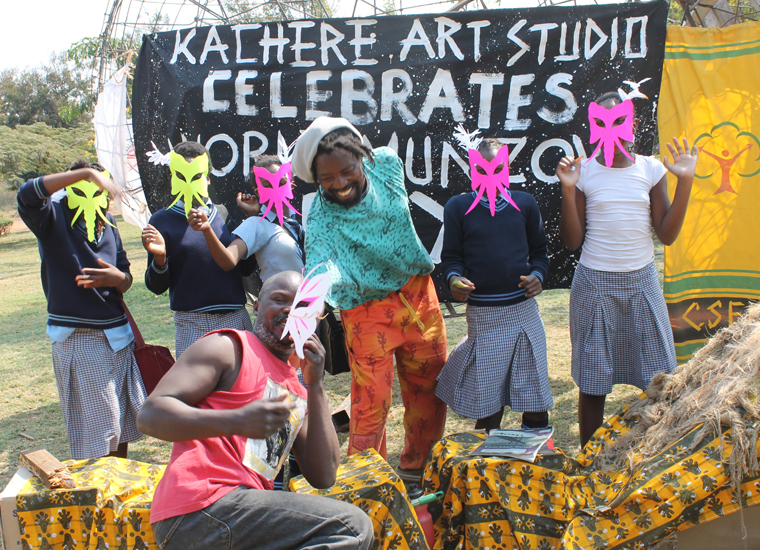 During last year’s Christmas season; working with homeless children they descended on a dumpsite at Lusaka’s Kamwala market where they turned trash into decorations to adorn a tree that is normally used as a urinal. During such sessions the team calls on passers-by and preaching the ecological gospel, as should be expected at Livingstone’s Green Elly for the next few weeks, if not months. Almakio Banda, a former Kabulonga Girls teacher who is currently applying his art teaching skills to a different cause. Banda, also a Kachere Nduna who was the head artist during the construction of Green Elly was on site during the Elephant Day commemoration randomly calling on passers-by, many of whom were surprisingly enthusiastic. And on Thursday Banda and Phiri were again on site educating the first fifty or so delegates of the expected 100 delegates of the Green Enviro-watch workshop. Nevertheless Green Elly’s frame took a combined team of about eight artists including Sydney Njovu, Martin Phiri, Posie Phiri, Cornelius Banda, Livingstone-based Zig Zag and skilled workers four months to complete. Her frame is so sturdy she can hold up to four adults on her back at a go and she took 22 grown men to load her on and off the truck that carried her from the art studio to the Civic Centre. In about a week’s time, the feeding of Green Elly will commence and the likely VIPs to kick start the cause are Minister of Tourism and Arts, Sylvia Masebo and the republican second lady Charlotte Scott. The Lions Day event that saw the participation of over 150 school going, as well as disadvantaged children was co-organised and funded by GRAD and the Wildlife Conservation Society. The initiative was supported by Olga’s Lodge, the Youth Community Training Centre, Manzi Valley, Big Five Safaris, Bukham’s, Inyatsi, African Impact, Samsung and Ocean Basket. Kachere’s Think Green Laboratory, an Alendo Travel and Tours initiative, is also supported in part by the Civil Society Environment Fund supported by governments of Denmark and Finland. Others are, The Lowdown, Horizon Education Trust of Turkey (Lusaka - Zambia), Fr. 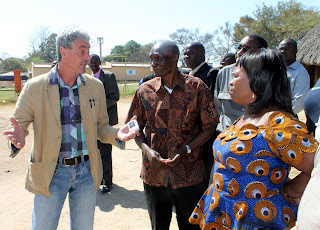 Dominic – Livingstone, Food Palace (Livingstone), Jolly Boys Backpackers and His Worship the Mayor of Lusaka, Daniel Chisenga. For most painters, the process of creating work is usually a solitary activity that involves long and fairly toilsome hours of daubing, spreading and tapping away on a canvas with their brushes and not saying a word. But for Patrick Phiri – not the football luminary – this is more or less the opposite. When he is not working at his full time job in his older brother’s bore-hole drilling company, he can be found in his front yard in Lusaka’s Chilulu Township ­– right next to the infamous Bitchland – with an erected easel and mounted canvas applying different colours to it while surrounded by family. The 42-year-old will be happily painting with his head tilted to one side while chatting to his welcoming wife Karen, his brother and several of his seven children ­– some whom can be seen returning from school – on any available topic from current affairs to sport. 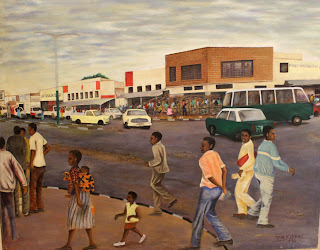 He was not voted among the people’s top four artists at the just ended Lusaka centenary exhibition at Manda Hill Mall, but he surely was one of the most entertaining, and his pieces displayed at the Shoprite entrance entitled Levy Park and On the Move, two representations of urban life in Lusaka could simply not be ignored. 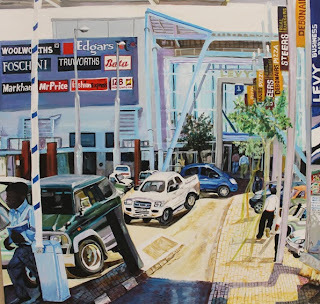 The work intentionally had a childlike unsophistication with its inventive distortion of figures, cars and buildings of which when coupled with the liveliness of his palette brings a very fresh and therefore welcome player to the Lusaka art scene. “I’m a self-taught artist, I started drawing when I was in grade 6, my educational background; I never went far, not beyond Grade 7. From there I started painting with friends in Chipata,” says the artist, insisting on having the conversation in English, and his articulacy did not at any point reflect his modest, educational background. Although he was raised in Chipata, he spent his school years in Matero, where he lived with his parents until his father retired and went back to his homeland in Eastern Province’s Chiparamba Village. Although he is as fit as an ox in adult life, at the time Phiri was frail due to an incessantly poor medical state. He later had to drop out of school, because of his bad health and the family’s financial instability. “In my career as an artist I am happy that I was part of the team that helped build the Visual Arts Centre in Chipata. 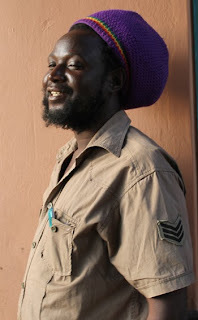 I learned a lot from there; especially from James Zimba who is now in Livingstone,” says the artist who often signs his work as “Wadada”, a word the Rastafarian explains means “love” in Jamaican patois. “Mr Zimba played a very big role in my development because there was a workshop funded by the Finnish embassy that he helped me attend. He was picking two artists from each province and I was picked with my friend Mzheba Dube who is still in Chipata. Then from there we came to Lusaka and had a workshop in Chalimbana under the theme Painting from Observation in in 1997”. The 1997 workshop may have just amplified an already existing, highly developed sense of observation in Phiri. “When painting On The Move, I just went into town, and stood at the junction, by the courts opposite Levy Park for a long time, then I went back and made a painting from memory” he says. But for the Levy Park painting, he used the image he took with his mobile phone. The location itself has sentimental value for the artist because the site used to be his father’s work place, the Mechanical Services Department (MSD) which later housed the Engineering Services Corporation (ESCO) Limited and subsequently became Levy Park, one of the country’s biggest shopping malls and business arcades, a location he used to come to as a boy. 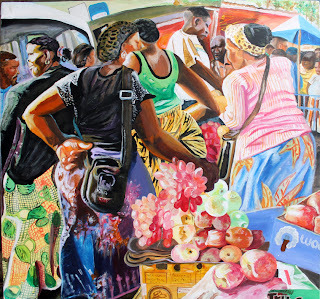 Nevertheless, the liveliness in his paintings may somehow be attributed to the fact that Phiri often starts a painting without a sketch, giving it a very raw vibrancy as can be seen in Fruit Traders, a work in progress that he was found working on this week. He casts the rules of proportion to the wind and although his paintings are not clear-cut abstractions, he sometimes juxtaposes his figures in a very unnatural way. In Fruit Traders, the most prominent character in the painting, a fruit vender almost has her face submerged in the arm pit of another, just to portray how crowded the city centre can get. And the fact that buyers are not regular does not bother Phiri. He explains that for him art is an inner passion and after all he has other means to make money and support his family, but every now and then a buyer does walk through his door. "I do sell. I sold one when we had an Africa Freedom Day exhibition, and the same white guy who bought my painting phoned me because my number was at the back, then he phoned me and asked me to e-mail some of my work, so when I did he asked me where I stay and he came home and bought a few more” he explains. 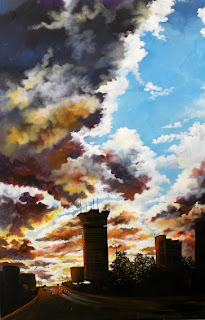 By the same token, the week-long Lusaka Centenary exhibition may not have been a huge business success on the day, having just sold one out of several dozen paintings, but it managed to show that there are a lot of artists still slithering out of the woodwork such as Patrick Phiri, artists whom we would have otherwise known nothing about. Watch this space for more relatively unknown artists of the Lusaka Centenary exhibition. “Dad that’s your grandchild you are defiling!” yells a single mother as she walks into the bedroom that she shares with her infant after a hard day’s work at the office. “I asked her and she agreed… sorry my daughter… but she was willing to do it” responds the old man, who is in the buff with the child wrapped in his arms. The woman is in a formal, nine hour per day shift but cannot afford a baby sitter and therefore entrusts her child in the apparently not so safe hands of her aged father whom she accommodates as a dependant. In a separate incidence, a well-known school teacher is in a local pub. It is pay day, and he has more than his share of Shake Shake opaque beer, as he often does around this time of month. Under the influence he gets up, wobbles to a large speaker in the corner of the room and takes his time to urinate on it. “Hey! Can’t you see you are urinating on the speaker”, screams the serious, but tolerant bar owner to his loyal but erring customer. “How can I see it when I’m sleep walking”, responds the drunk teacher. As luck would have it, the bar owner forgives his intoxicated patron and goes on to drive him safely home. While both these scenarios are intensely dramatic, the licentious grandfather affair can be described as revolting and the stoned teacher episode as hilarious. And as bizarre and fabricated as they might appear, these are factual incidences that actually took place in Lusaka’s Malata compound just a couple of months ago. The incidences were not broadcast on any community radio or television station nor printed in any newspaper. 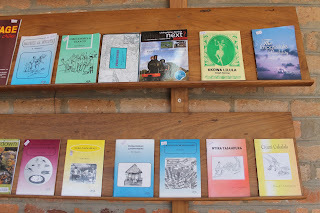 However, these and similar tales are ‘published’ by Post Malata. What is Post Malata? You ask. A person, a magazine or newspaper of sorts. Well, no. 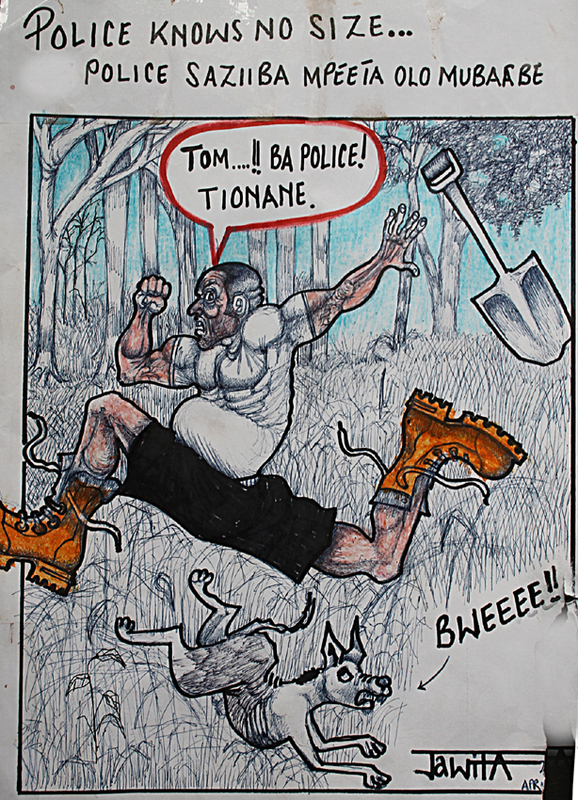 It is a series of one-page ‘cartoon bulletins’ that chronicle the foolishness, humour and tragedy of everyday life in the tiny township of Malata. Nestled between the leafy suburbs of Kabulonga and Ibex Hill, in size Malata is just a fraction of your average high density township, so everyone knows everyone. And everyone knows Duncan Ngoma from a converted container that serves as a popular grocery shop in the market and his friend Wisdom Vundika Fwati the resident cartoonist and author of Post Malata. 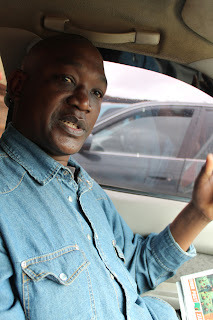 Mr Fwati explains an ordeal that he recently ‘published’: “There is this well-known guy, one of the neighbourhood thugs whom everyone fears went to steal cement from a construction site but when a friend alerted him that the police were nearby. He ran away and in the process trod on sleeping dogs waking up the entire neighbourhood with their howling and scampering”. 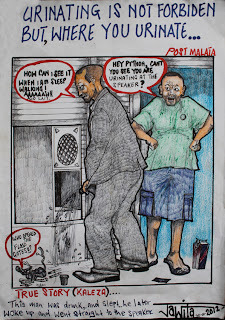 He explains that the following day, some residents went to Ngoma’s shop and asked whether he (Mr Fwati) had heard the latest, and asked him to draw it for Post Malata. But it is not everything that is published. Mr Ngoma (from the shop) admits to self sensorship or indeed a media regulation of sorts. He functions as a provisional editor to ensure that his friend’s cartoons do not assassinate anyone’s character. 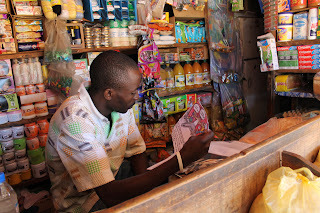 “This is a small compound and we wouldn’t want to make enemies with each other, Look at this it,” he says picking up a censored copy of the Post Malata that did not make it to the wall “This happened at one of the shops here, these two boys broke into a shop to steal but were caught. Everyone knows the little boys and the father to one of them is our friend so I decided not to stick it up”. In essence the community has embraced Post Malata as a means of news dissemination, where they can be informed about some of the township’s peculiar activities and luckily they have Mr Fwati in their midst. His drawings have conscious innocence, combined with humour and a keen insight into character. Coupled with his ability to portray spur of the moment scenarios it is not surprising how the drawings have caught on and captured the attention of an entire community. 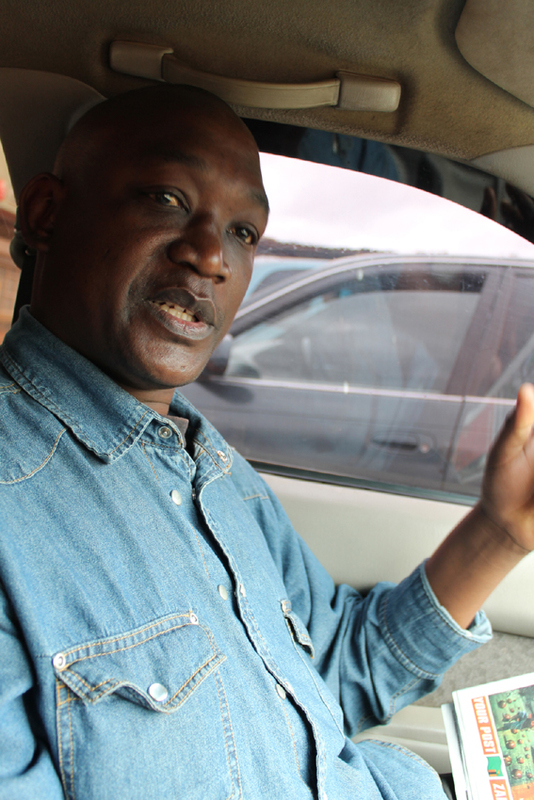 Although Mr Fwati is up to date with the goings on in Malata, he himself is a non-resident. 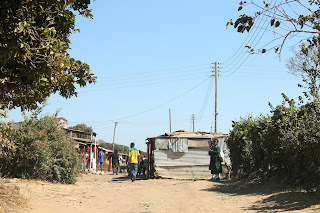 He lives in Mtendere Township, not too far away, and only comes to Malata when he is either visiting his friend Duncan or his mother, a retired teacher who resides at Chibelo Basic School and is still waiting for her pension. For his drawings, he uses regular blue, black or red ball-point pens (the type you will find in a school bag) on whatever piece of standard A4 sized white paper he can find. Each illustration carries its own bold, hand written headline as well as a caption describing the episode in detail with a footer in the corner that reads “True story (Kaleza)…” of course kaleza being the chi Nyanja for thunderbolt. Customarily, in many of our local languages, we swear upon a thunderbolt. Meaning in case the utterer is lying, may a thunderbolt strike him or her where they stand. But as much as Mr Fwati swears upon thunderbolts, he still appears to play not only the humourist, but the moralist, because in every cartoon is actually a teaching of social significance. 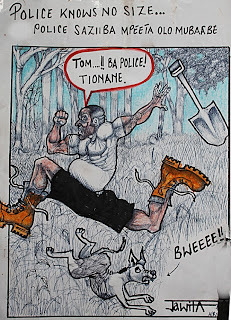 What is most noteworthy about this artist and his Post Malata is the social dynamics of how a cartoonist hungry for an audience is able to find his purpose as a satirist in the community by default because he has no other space to channel his creative expression. Nonetheless, this is nothing new. It is not the first time an artist is having upfront contact with his community audience by means of site-specific art that challenges the innocence of space, in this case a market stall. The ‘tavern art’ of the pre and post-colonial era was born out of artists’ calling to be a mouthpiece in the community; again both humourist, and moralist, just like Mr Fwati. Although tavern art started out as graffiti, it was beloved by the township dwellers who could relate to it because it told their story. It was their art. Art for the people by the people. 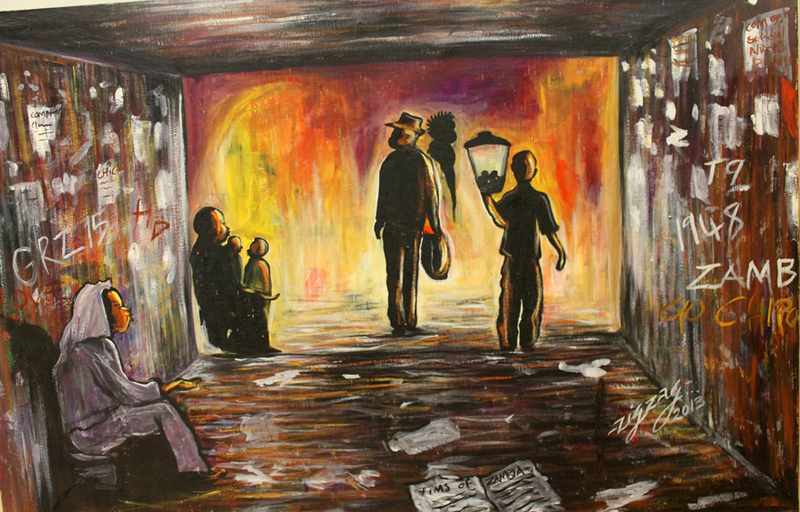 Some of Zambia’s most prodigious artists such as the fabled Akwila Simpasa of Freedom Statue fame started out as tavern artists in Chamboli, scribbling everyday scenes of oppression and police brutality in charcoal on the walls. Attaining folk hero status, tavern artists were never arrested by the authoritarian Mine Police because the community enjoyed the art and would raise the alarm whenever the authorities were at hand. “We cartoonists have got a lot to offer but have nowhere to show our work. Newspapers and magazines do not give us the opportunity. When they do the money is very little, they do no appreciate our creativity,” complains the Kitwe raised Mr Fwati who is cagey with details of his date of birth and just says he was born in Chamboli in the 70s, went to Rokana and Kitwe primary schools and subsequently completed grade 12 at Serenje Boys in 1991. It is common knowledge that the ever mushrooming Zambian shopping malls and arcades receive more visitors than any museum, art gallery or exhibition. 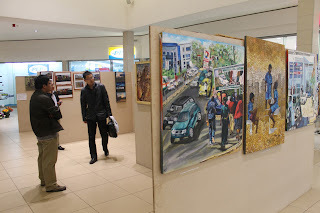 So where better to hold an art exhibition than take it where the crowds are, as did the Lusaka 100 Committee, who organised an art show at the Manda Hill Shopping Mall which has a daily average of 4,000 (four thousand), visitors according to official estimates. 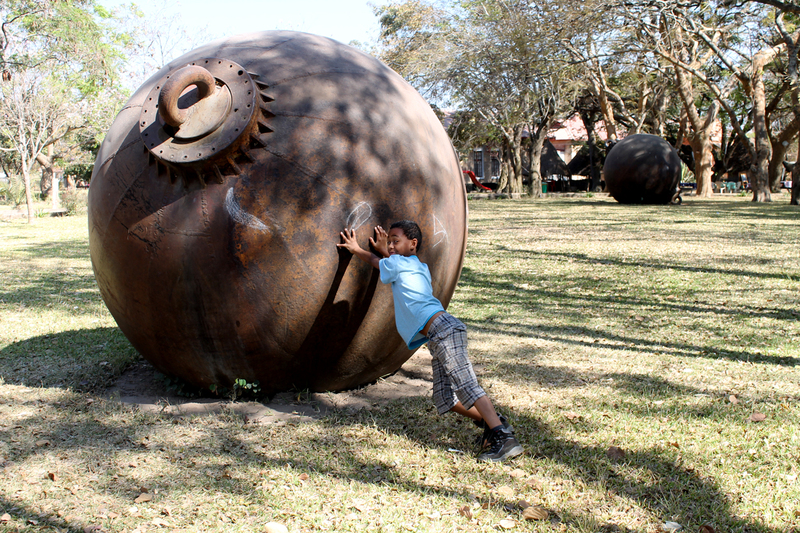 The week-long exhibition was just one of the many activities around the city that the committee organised as a commemoration of Lusaka turning a hundred years old. “The Visual Arts Council (VAC) have been wonderful, I’ve been going there every week to check on the artists that had been producing work specifically for this exhibition and as you can see they have produced fantastic work”, said Quentin Allen, one of the organisers and participating artists who explained that he made a call for participation through VAC. “You can tell they’ve enjoyed painting their city. Manda Hill Centre also put their posters up and we got some responses from them as well, plus the space is very generously provided and Manda Hill is not even charging any commission on sales of the work”. But in any case, even if the Manda Hill Centre were to charge a commission, as of Tuesday this week, sales were dreadfully poor despite the enthusiastic audience of mall-goers from all walks of life who were requested to leave comments in a book as part of the judging process because the exhibition was in essence an art competition, with the general public serving as a jury. “Everyone has been commenting, I mean everyone, from the people cleaning the floors, the security guards, the shoppers, I haven’t seen a single negative comment yet” explained a perceptibly cheerful Allen. Allen’s optimistic attitude was echoed by sculptor Nezias ‘Neziland’ Nyirenda who was showing a few functional wood sculptures that included a Findeco House-shaped lamp shade and his Mr Environment. “It is not about the sales. Just to have this exhibition in a public space like Manda Hill is a big achievement. The other day I just had to politely advise a lady that you are not supposed to touch the art work”, said Nyirenda. He said that a lot of viewers lacked gallery or museum etiquette and did not observe the “don’t touch” rule; as such this was also a learning experience for them. However, as much as the display was a celebration of the city turning 100, it was not entirely a retrospective exhibition. A lot of the work celebrated a “new” Lusaka, there was very little or no trace of the city once being a village of the indigenous Soli people, or the exhibition site Manda Hill Mall itself, along with the area surrounding the parliament buildings, being the former burial location of Soli royalty as the name Manda (grave) suggests. The show consisted of two main exhibition spaces each just outside the entrances of the shopping mall’s two anchor stores Shoprite and GAME Stores. The works at the Shoprite entrance had very energetic imagery besides the fact that Findeco House, the 24 story building that is not only the country’s tallest but most famous building was a recurring icon in a lot of the paintings. But, interestingly, the artists made artwork of everyday backdrops that we are blinded to and often take for granted as we are consumed by the hustle and bustle of going about our daily business in our beloved city. 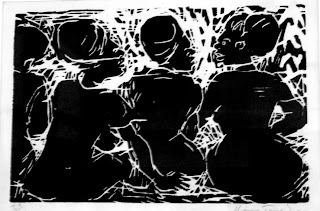 A good example would be Blind Man’s View by a Livingstone-based artist who calls himself Zigzag. 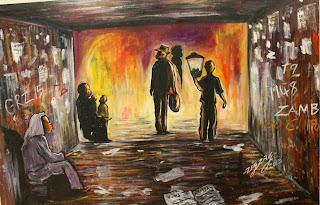 It depicts any of the two foot underpasses of the cities two flyover bridges which are popular beggar havens. It is the kind of painting that makes you stop and say “I have seen this before”, but then you cannot immediately say where. But one of the more nostalgic pieces is a 1994 painting entitled Freedom Way by David Chibwe. 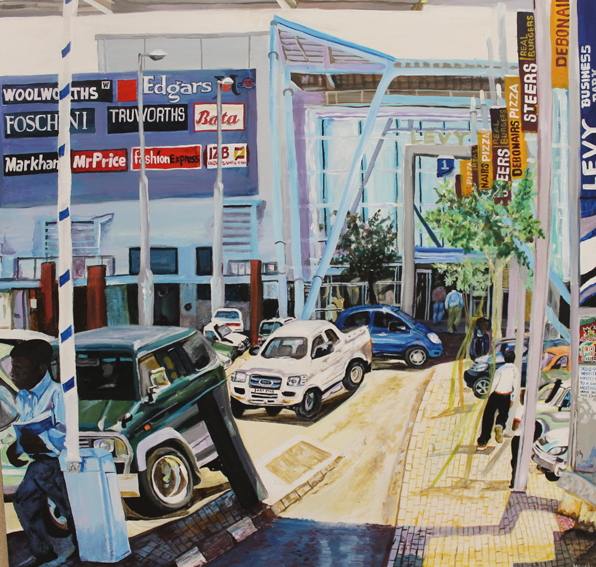 It depicts a busy junction on one of the city centres main roads and is literally layered with incarnations of times gone by, the dressing, the cars, the stores and potholes. It has a two point perspective; to the left you see Africa Bar, known as Stanley Bar at the time of its closure about five years ago. Still an iconic element of the city, the bar had its history rooted in colonial Lusaka where it was “the happening” place for locals (or blacks as it were) in Northern Rhodesia. But in its later years the bar was popular for the opaque beer Shake Shake and the washed-up ladies of the night known to sell their services in broad day light for nothing more than a single packet of the brew. 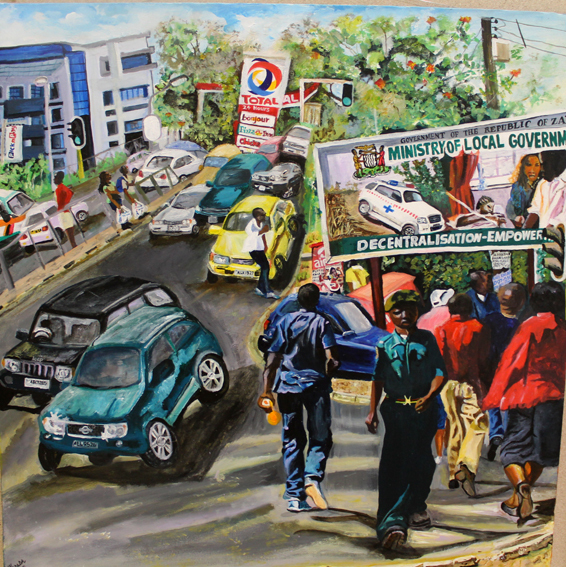 The perspective point on the right depicts a minibus and a taxi painted in green, a colour that was the official tint for public service motor vehicles under the UNIP led government, when the MMD was ushered in they had the buses painted blue through a “regulation 14A of statutory instrument number 115 of 2000” and now that the PF government are at the helm the Ministry of Communication and Transport requires that buses be painted orange or at least have an orange stripe. 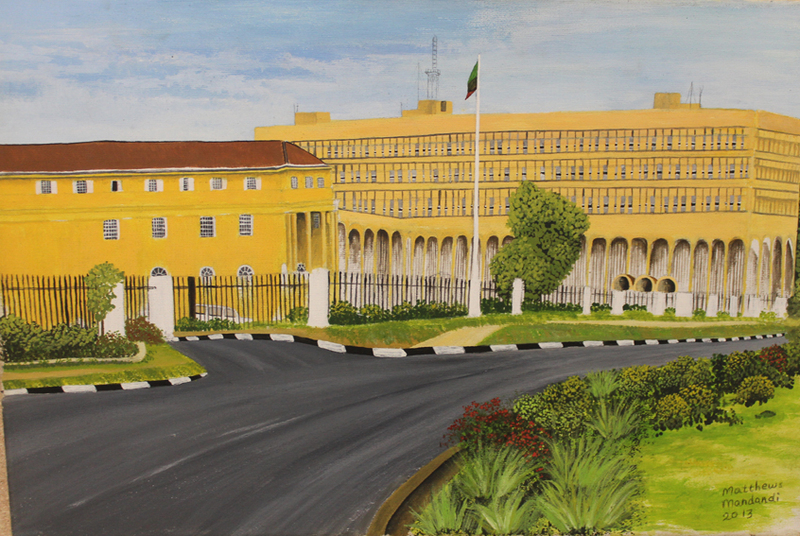 Unknowingly, the artist has reminded us that essentially, a Zambian ruling party might as well be identified by a change of bus colours during its reign. Anyway, the works at the entrance of GAME stores were just as energetic and entertaining as the ones at the Shoprite entrance, except they were more general in theme, and did not adhere solely to the portrayal of the city. It had works by notables like Style Kunda, Poto Kabwe, Geoffrey Phiri and Charles Chambata alongside some promising young artists such as Mapopa Manda. In fact, Manda was manning this side of the exhibition and monitoring the comment book. 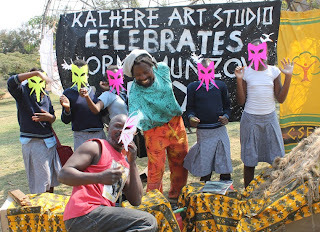 He was excited by how the event had turned out to be sort of an art outreach programme. “It is going on very well, and people are interested in meeting specific artists whose work they like. Some have even got my number and are saying they will come to our studios in the show grounds”, explained Manda. But before Manda could continue narrating how well the exhibition was going, the conversation was interrupted by a vigilant, uniformed guard from G4S security, one of the companies that provide protection at the mall. “You are not allowed to take pictures here”, he said looking directly at the camera hanging from the authors shoulder. Even after the author explained he was there as a journalist on duty with full permission from the exhibition organisers to take photographs and report on the display, the adamant guard stood his ground. “You are not allowed, the centre management does not allow. If you want to take pictures you have to go to the offices and get permission from the (Manda Hill) centre management”, he said. 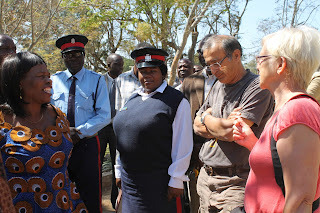 From the look of things, the security officer, with a mobile, two-way radio transceiver crackling in hand appeared to have just been instructed to approach the trio who were casually engaged in art chatter, among them Post Newspapers Technical Manager Andrew Chiwenda. But in any case, this was an easy choice brought forth by the guard. Who has time to go to the mall administration offices to seek permission to take photographs? It would have been a nonsensical thing to do whatsoever. We are living in times where some mobile phones have more powerful image capture gadgetry than an actual camera. Every now and then you can see excited teenagers and adults taking pictures at the mall and upload them to Facebook at the click of a button, do they all go to management to seek permission?. Also, you can see predominantly European tourists with cameras that make the author’s Canon look like a toy; they too take pictures at the mall without being questioned, do they have a racial advantage that permits them to do so. Speaking of which shortly after the guard successfully accomplished his duty of prohibiting the author to use a camera, Quentin Allen arrived on the scene oblivious of what had happened, with camera in hand busy snapping away in full view of the guard, but he was not approached. But obviously Allen was allowed to do so because of one of many factors; because of his infectiously jovial character, because he was one of the organisers, because he had sought permission or, you guessed right, because he is a “muzungu” (white person). Well if Manda Hill Centre Management does not allow cameras on their premises, or if they grant permission by race, they might as well place signs all over the mall. As we commemorate 100 years of Lusaka, let us also celebrate small things such as the fact that today one is able to use a camera or have their photograph taken in formerly restricted areas; the Main Post Office, the railway station and the Kenneth Kaunda international airport. Nevertheless, four artists emerged the peoples’ favourites of the exhibition. The most popular at the Shoprite display were Caleb Chisha for his painting Bufi and Spider Kangolo with his Findeco Chair. 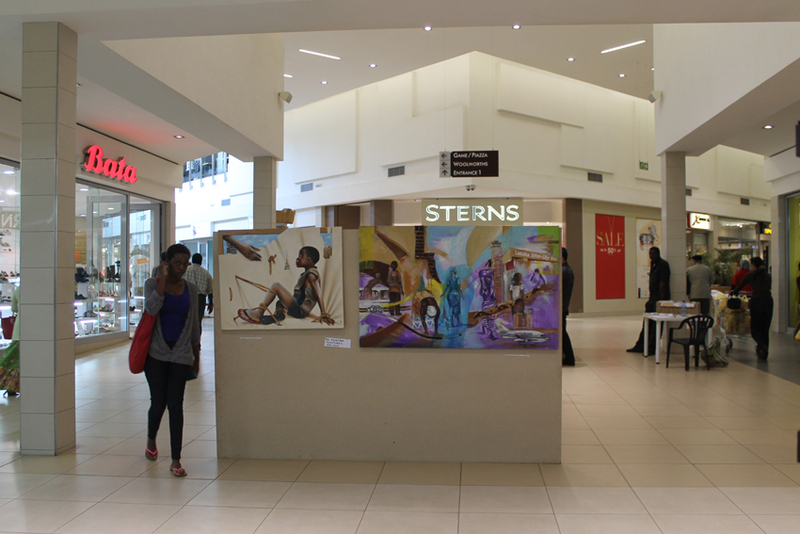 Nsofwa Bowa’s Hope and Owen Shikabeta’s Building In Tune carried the day at the GAME Stores display.